The Chinese giant salamander has become a delicacy – that means people like to eat it. But there are now very few of them left in the wild. Neil and Catherine bring you the language you need to talk about this story. A creature that has been around for millions of years is now in danger of extinction. The Chinese giant salamander has become a delicacy – that means people like to eat it. But it seems they like to eat this particular animal too much as there are now very few of them left in the wild. Neil and Catherine bring you the language you need to talk about this story. 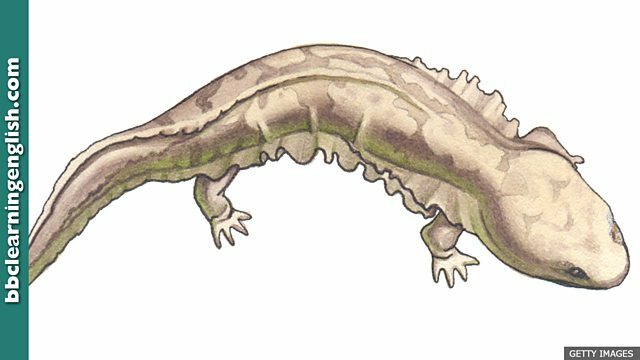 New zoological research has suggested a growing human appetite for the Chinese giant salamander has pushed the world's largest amphibian to the brink of extinction in the wild. The creatures, which date back 170 million years, have in recent times become a delicacy. Researchers say they've nearly completely disappeared from their traditional freshwater habitats. After some bad investments, the company is on the brink of bankruptcy. Thousands of people are buying Neil's album. He's on the brink of rock stardom! Eating everything raw is the latest food fad. He says eating fermented food will make him live longer but I think it's a food fad. The snake slithered through the grass. She slithered under her desk to try to find her keys. There is no letter 'a' in this word. Which is the correct spelling of this word that means 'moving over a surface by twisting from side to side'? The correct preposition begins with 'o'. Which preposition completes this phrase? The brink _____. Newspaper headlines love alliteration (pairs or groups of words that start with the same letter). Which word describes an activity that becomes very popular for a short period of time? c) If something is amphibious, it lives on land and/or in water.